We’ll be debuting our second issue of The Leading Edge, Hartzell’s aviation industry magazine, at Sun n’ Fun this year. To celebrate, we’re sharing an excerpt of one of the interviews we’ll be featuring in the magazine. 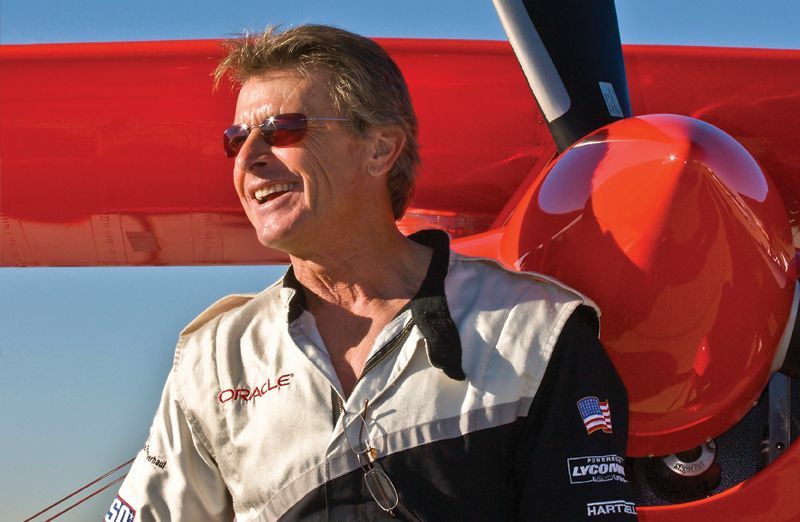 Ace aerobatic pilot Sean D. Tucker recently took the time to sit down with us and talk about all things aviation, from his early fear of flying to the founding of his flight school. HARTZELL: So you have to give us the scoop on this one. We keep hearing that over half the maneuvers you’ve performed over the course of your career have never been duplicated. Is that true? TUCKER: [LAUGHS] Don’t you love all the stories out there about me? I was very, very fortunate to be coming up on the scene early. When the gyroscopic envelope – the tumbling envelope – was just being investigated (as an aerobatic maneuver), I was there. What’s so great about that is when somebody opens the door and says it’s possible to do a maneuver, then you can take it to the next level, and somebody opened the door for me. What I would say is I am an innovator in this type of flying, the aerobatic, high performance, gyroscopic tumbling and flipping and twirling airshow demonstration flight. I was early on in the scene and this is a scene that is growing because it’s very exciting flying. We are mesmerized with what these airplanes can do, and what the technology can do. With better technology comes more opportunity for us as pilots. With the carbon fibers, and the designs of the wings and the tails and what we’ve learned from yesterday, we’re doing something completely different for tomorrow. We’re almost flying airplanes like they’re model airplanes now, and that’s really fun, because we’re doing things with them that used to only exist in our imaginations. HARTZELL: What inspired you to even attempt some of these maneuvers, especially in the early days before we knew what was really possible. What is the process like for coming up with new maneuvers? TUCKER: It takes years to develop your sequence. Years and years and years, because it’s challenging and it’s dangerous and everybody has a style of how they fly. So it’s a learning process. I’ve always been compelled to be better, and to make it better, and to make it more dramatic, more dynamic, so I’m always challenging myself. When I got this new airplane five years ago – it took a year and a half to build, and it’s magnificent! – I had to learn to fly it, know everything about it, so I couldn’t change my sequence. After about a thousand flights in the airplane – which is about two years – I really came to understand the machine, and then I wanted to grow my repertoire of how I want to perform for the audience. So you’re always thinking about how you can have a better sequence, but it takes years to do it. You just can’t add things. Remember – we’re humans flying a machine, there’s not computers that help us with our elevators and our elevator mounted throttles, it has to be very tactile – man and machine have to be one. There’s no computers analyzing exactly what you need, and you’re doing it in a low level environment, in a show environment, and it doesn’t happen overnight. So every time I add a figure, it’s probably taken me two years to figure out where to put it in the sequence, how to do it safely, how to make sure that it’s 100% predictable. To read the full interview with Sean D. Tucker, be sure to visit our booth at one of our airshow appearances this year and ask for a copy of The Leading Edge, Issue #2.